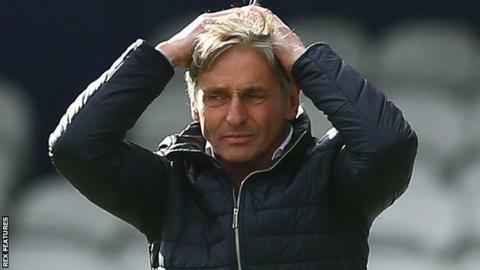 Jose Riga has resigned as head coach of relegated Championship side Charlton following their 3-0 defeat by Burnley. Riga, 58, returned for his second spell at The Valley in January on an 18-month deal after the sacking of Karel Fraeye. But the Addicks won only five of their 19 games under the Belgian, and they were relegated to League One in April. Fans held a sit-down protest outside the ground before Saturday's game, the latest in a string of demonstrations against owner Roland Duchatelet. Riga had previously spent three months as Charlton boss during the 2013-14 season, helping them avoid relegation before being replaced by Bob Peeters. He rejoined the Addicks with the club 23rd in the table and on a 10-match winless run, but could only lift his side up to 22nd, finishing nine points adrift of safety. "The club would like to thank Jose for all his hard work over the last few months and wish him the very best in the future," a club statement said.